Exercise Physiology & Rehabilitation at Clinic 88 is conducted by fully qualified and ESSA accredited Exercise Physiologists. Clinic 88 offers accredited Exercise Physiology sessions for treatment of a wide variety of injuries and chronic conditions. Our Exercise Physiologist Marcus Jolly is an allied health professional with Medicare provider number and can receive referrals from your doctor for treatment on an Enhanced Primary Care Plan, can treat patients privately or provide treatment for Workers compensation claims (including Comcare), CTP claims and Department of Veterans affairs clients. As of November 2009, 5 sessions per year with an ESSA accredited Exercise Physiologist will be rebated by Medicare to the amount of $52.00 per session. To gain this rebate, clients must first be referred for this service by a General Practitioner. Please consult your GP if you wish to gain access to this rebate. Clinic 88 offers individual and group sessions for veterans under the DVA scheme tailored towards each individual’s needs. With extensive experience in treating veterans many common conditions treated include back injuries, knee injuries and PTSD. All that is required is a referral from your GP. Entitled Department of Veterans’ Affairs clients may be referred for clinically necessary Exercise Physiology treatment on a valid D904 referral form. Patients with Type 2 Diabetes are eligible for assessment and enrollment into group programs when assessed by an ESSA accredited Exercise Physiologist. Please consult your GP if you wish to gain access to this rebate. Clinic 88 offers Exercise Physiology sessions and rebates to individuals who have an enhanced primary care plan. We specialise in treating individuals with chronic disease conditions and tailoring programs which can be completed under supervision and at home to form a major part of a rehabilitation program for many disease conditions. Energise! 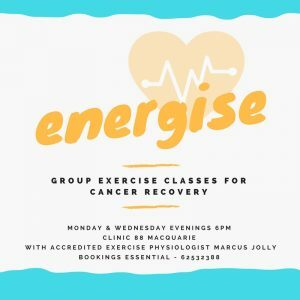 Group exercise classes are offered at Clinic 88 Macquarie for patients recovering from cancer. Classes run Monday and Wednesday nights 6-7pm for 8 week terms, $15 per class paid up front in full at commencement of term. Classes are limited to 8 participants and an initial consultation with Exercise Physiologist Marcus Jolly is required before starting classes. Come and exercise and socialise in a safe and welcoming environment! Bookings are essential, please call us on 62532388 for further enquiries or to make a booking. Term 1 2018 to commence Monday 15 January 2018. Exercise Physiologists are trained in utilising the right forms of exercises for a variety of chronic disease conditions. Here at Clinic 88 we have experience in treating a range of conditions including respiratory issues, heart conditions, diabetes, obesity and many more. Our staff are trained in the limitations that these conditions place on the individual and tailor the program to assist each individual in managing their condition. Our Exercise Physiologists are experienced in treatment for work related injuries and return to work plans. We utilise graduated exercise to treat workplace injuries and tailor the exercise program to assist individuals in rehabilitating towards a return to work based duties. Completing initial assessments focused on functional capacity programs are created to assist individuals with their ongoing rehabilitation and return to work under public and private schemes (Comcare, WorkCover ACT and CTPI claims). Clinic 88 specialises in programs focused at the strains the modern working world places on the individual. With programs tailored towards common office based conditions (e.g. neck pain, headaches and back pain) we assist people to get the most out of their day. We are able to provide safe and professional advice to assist you and your team reach your best in all workplaces.